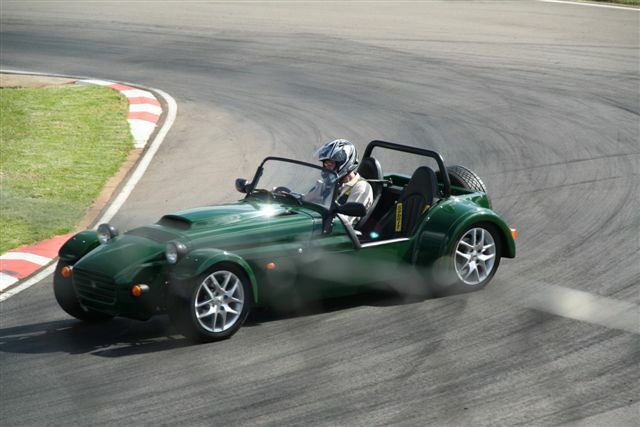 The car which the press nicknamed the "White Knuckle Ride", this is the first Westfield SEiGHT to hit the roads (and tracks) of South Africa. Powered by a lightly modified Rover 3.6L V8, The car is a Westfield SEiGHT 'Full Module' kit, obviously for such a British sports car and Rover powerplant it had to be British Racing Green, with the additional options of the competition suspension pack, low ratio steering rack, limited slip diff and AP four-pot callipers 'up-front', this should be a serious performer. 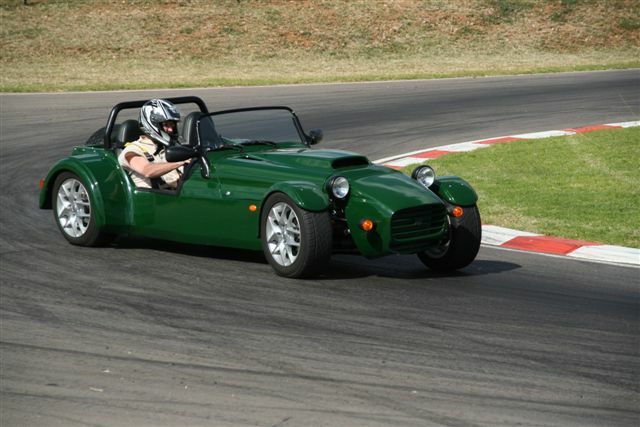 We took the Westfield SEiGHT out to Zwartkops for their SuperPole event, timed runs around the Kart track was great fun, thanks to the Zwartkops Owners Club for a great day, and to Dave Hastie and Andre Du Plessis for these pictures. We took the SEiGHT along to Zwartkops, we were given a prime spot right in front of the canteen and got the chance to send Jim out on the track at the start of the main races to 'show her off'. Thanks to the guys at Zwartkops for a great opportunity, and especially to Jon for the commentary and interview. Also a big thank you to Andre, not only did he take all the great pictures, but also helped us out all day. Click on the pics for full image. The power from the Rover V8 with the light weight makes for a stunning car, the exhaust system keeps the noise down to a reasonable level, but the exhaust note subtly lets you know there's power lurking in there. Apologies for the picture quality, as you see it was raining, the light was terrible, and I think my hands were still shaking a little :-), click on the pics for the full size original. More pics to come once she's 100% complete. 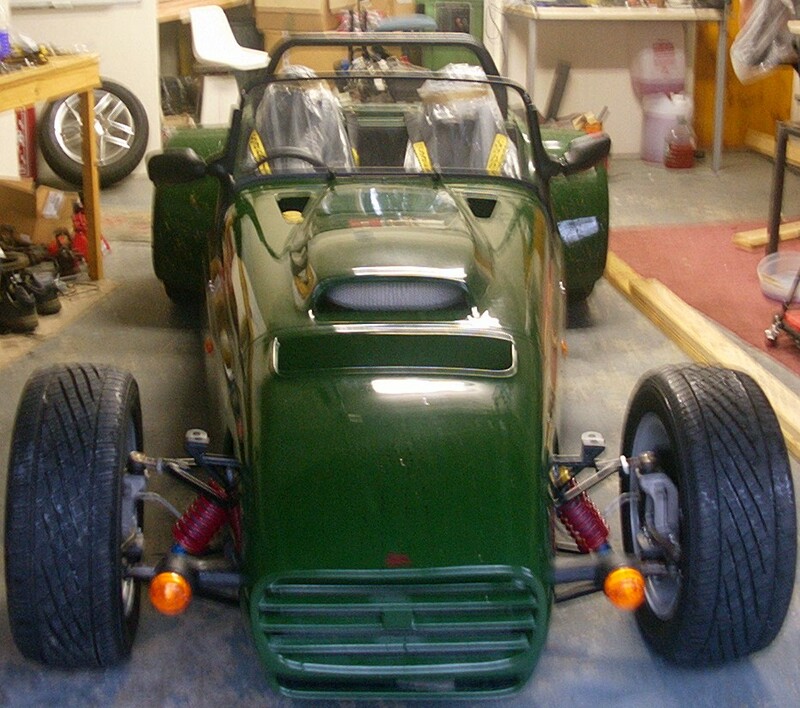 The pictures below show the car with all the running gear installed, and a 'scrap' engine block and gearbox for the trial fitting of the custom made exhaust system.